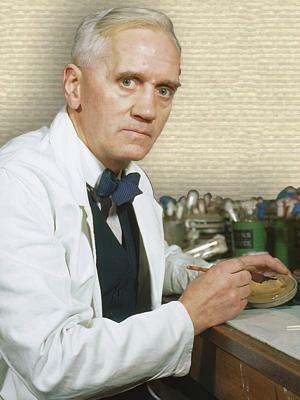 Scottish bacteriologist who shared the 1945 Nobel Prize for Physiology or Medicine for his discovery of the antibiotic penicillin (1928). 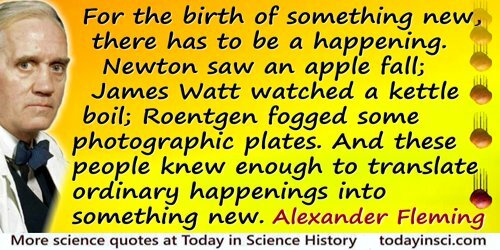 This resulted from his observation of a mould which had developed accidently on a staphylococcus culture plate and that the mould had created a bacteria-free circle around itself. Quoted, without source, in Calyampudi Radhakrishna Rao, Statistics and Truth (1989), 23. 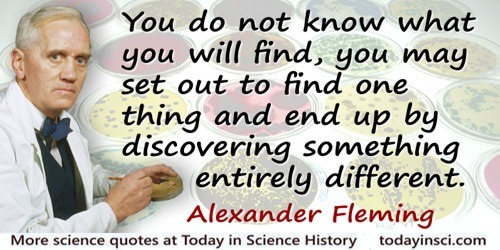 You do not know what you will find, you may set out to find one thing and end up by discovering something entirely different. 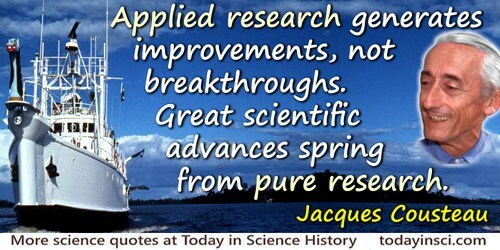 About “pure fundamental research.” From Dedication Address opening the Oklahoma Medical Research Foundation, Fleming stressed training “to look for significance in scientific ‘accidents,’” and “the importance of serendipity in science,” as well as a “free atmosphere which will allow genius full play.” In 'Penicillin Discoverer Calls For Free Path for Research', New York Times (4 Jul 1949), 1. 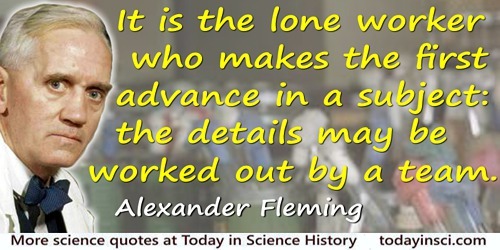 6 Aug - short biography, births, deaths and events on date of Fleming's birth.